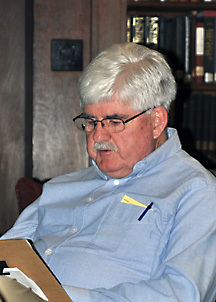 Mike Cavanaugh is a founding member of the Old Baldy Civil War Round Table, serving over the years as treasurer, program chairman, and twice president. His interest in the Civil War began in the early 1970s, when he found he had several ancestors in the war. Mike’s great grandfather, on his father’s side, Pvt. Thomas Holleran, was a member of the 96th PVI (raised in Schuylkill County) and on his mother’s side, Cpl. James Lindsey of the 1st New York Mounted Rifles (raised in New York City). Mike has authored and coauthored five books on the war and also founded the Civil War Book Exchange (now Civil War News). For more than thirty-five years, he has had an avid interest in the Battle of the Crater fought on July 30, 1864, in Petersburg, VA. This led to a book in 1989—coauthored with Bill Marvel—entitled The Horrid Pit, The Battle of the Crater. A long time volunteer at the Civil War Library and Museum, Mike served as Vice President of the Board of Governors for a time and also served as treasurer of the committee to erect a statue of General John Gibbon at Gettysburg in July 1988, the 125th anniversary of the battle. This committee was made up of members of the Civil War Library and Museum and the old Baldy Civil War Round Table. Born in the coal country of Schuylkill County, Mike has an avid interest in the history of the Molly Maguires. This group of Irish coal miners had a running battle with the coal companies and the law in the 1860s and 1870s. The so-called “King of the Mollys,” Jack Kehoe, may be related to Mike. His great-grandmother was from the village of Avoca in County Wicklow, Ireland. Her maiden name was Tracy. Jack Kehoe’s mother was a Tracy from the same small village of Avoca. Today Mike lives in Bethlehem, PA with his wife Susan, who is also a member of the Old Baldy CWRT. Mike shares his round table time with the CWRT of Eastern PA in Allentown of which he is the program director. He feels the most important duty of a Civil War round table is to support battlefield and historical preservation. Mike’s main interest today is World War II, especially the War in the Pacific. He regularly attends many World War II events where he has the opportunity to meet the veterans and hear their stories.